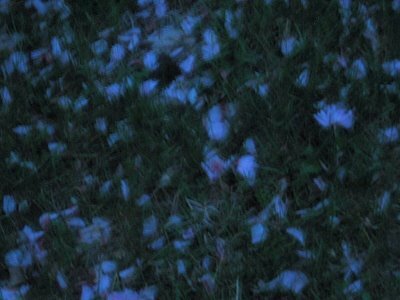 I was experimenting with taking pictures at night (long exposures of cars driving by, etc) and as a throwaway, took this one of fallen appleblossom petals on my lawn. I can't decide if it's beautiful or a blurry failure - you tell me! It's really worth experimenting as it enhances your understanding of how light and the camera works. I did some ten second exposures in the park the other night and got some really weird effects. Agree with Bob, you really have to have a lot of patience with photography, and experimenting is a must! It's nicely layered and textured. A success. Blurry failure, no. Lovely, yes. I take tons of photos and may be satisfied with just a couple. It's great to experiment. I have tons of CDs full of photos. I enjoy your pictures a lot and I like this one.